in video production and duplication facilities.
) 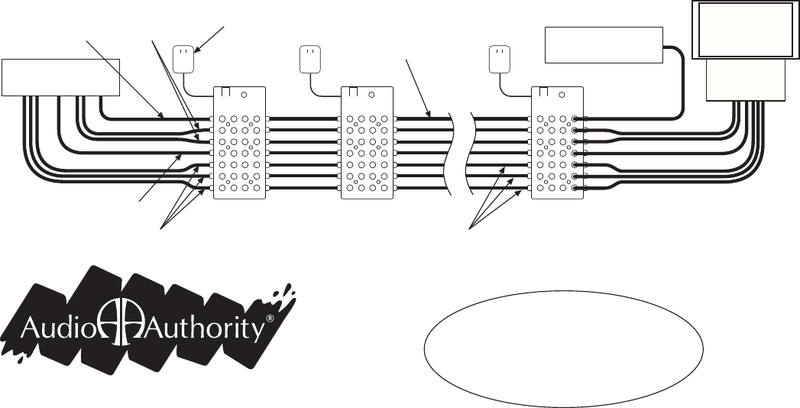 from the source to four audio control centers or television sound inputs, or left/right stereo audio. sound system to a Digital Audio output jack on the 985U. adjustments are required. In the event of hum bars or other picture disturbance, adjust the GROUND switch to minimize the symptom. Do not connect televisions to the Bus Ouput, or leave uncommitted cables connected to the Bus Output. correctly in 75 ohms at all times. Make sure the Ground switch is turned OFF. inputs on each TV. Do not connect televisions to the Bus Ouput, or leave uncommitted cables connected to the Bus Output. adjustments are required. In the event of hum bars or other picture disturbance, adjust the Ground switches to minimize the symptom. Call Audio Authority Technical Service at 800-322-8346 for assistance.